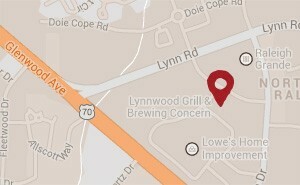 See What's Happening at Lynnwood Grill and Brewing Concern! 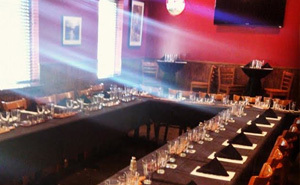 Cater your next gathering with us. Serving the Northwest Raleigh area and beyond, Lynnwood Grill & Brewing Concern is a neighborhood bar and grill where the staff and other customers know your name and you look forward to spending time with friends and family. Our team brings dedication to quality food, outstanding service and, most importantly, a fun time. Start your meal with one of our dozens of appetizers and follow it up with a specialty pizza. Our sauces, dough and toppings are prepared fresh daily using the fresh ingredients, including many organic items. If you’d rather have a wrap, sandwich, baked specialty, salad or bowl of soup, they’re just as tasty. You can’t go wrong with our full bar in Raleigh, NC, as well as our wine list and variety of beers on tap — including our very own award-winning microbrews from Lynnwood Brewing Concern. With our house-brewed craft beer and great weekly specials, you’ll want to come back for more. Our calendar is packed with community functions, Wednesday night trivia and other events, so there’s always something exciting happening at LBC. Located in the Grove Barton Shopping Center near the Raleigh Grande, Lynnwood Grill is proud to serve the local community and sponsor teams, fundraisers and tournaments. Stop by after your walk at Umstead State Park for a snack, and sit and stay awhile to enjoy our craft beer and specialty pizza in our rooftop seating area. Try ordering our food online for an easy night at home. Come to Northwest Raleigh’s most comfortable bar and grill for great food, great drinks and a great time, every time. Contact us about our catering services, or visit us near the intersection of Glenwood Avenue and Lynn Road.